a31chris wrote: No the comment wasn't in jest and I stand by it. Well I'll back off a little on the 'completely' remark. But in large Gamepro and DieHard GameFan were horribly biased. 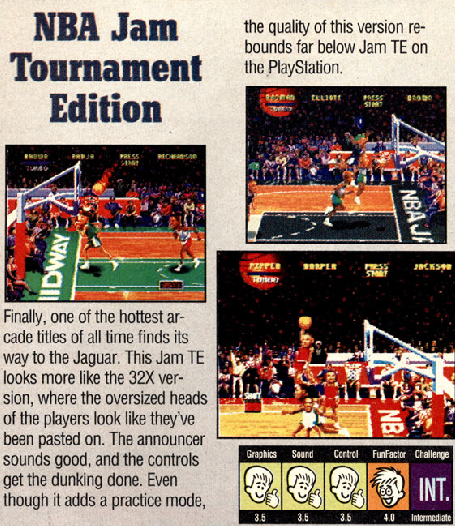 Wasn't Gamepro the one that called NBA Jam on the Jaguar worse than the SNES version? And even if they had, so what? GamePro published thousands of reviews over its more than two decades of existence, and because you personally degree with their conclusion in one review, you consider that to be proof that the magazine had such a reputation for being biased that no one read it? Are you for real? And what is funny about this is the PSX and Saturn versions don't even default to the big heads. The sprites are oversized like they enlarged them to fit the big heads. He says the big heads look pasted on but mentions nothing about the big heads not even being present by default on the PSX/Saturn versions. a31chris wrote: I'm not going to get too far into this but that was one example that sticks out that was very blatant. No of course not basing it on one review. You assumed that. I had no choice but to assume it, since you've said absolutely nothing else to support your bizarre claim that GamePro is biased. Quite frankly, it's comments like yours which have given Jaguar fans a reputation of being defensive to the point of outright delusion. Yeah we're all kindsa nuts.